The San Diego neighborhood of Clairemont more than holds its own when it comes to hidden gems. Located between La Jolla and the Convoy district, Clairemont is loaded with so many international food options that it surely deserves to be recognized as its own distinct and diverse food destination. Does curried pork between two sticky rice “buns” actually qualify as a burger? That question may not be as relevant as this one: How soon can you get to Thai Burger Company? Try their barbecue pork burger, chicken satay burger, fried tofu burger, and other inventions like ground crab balls on a skewer. More familiar treats like pot stickers and boba tea are on hand as well. Here you’ll find classic Cuban dishes like Cubanos, chicken fricasse, and empanadas, made with locally sourced ingredients, grass fed and hormone-free meats, organic greens, and non-GMO cooking oils. The vegetarian plate of roasted vegetables and yuca fries sounds just as good as the wine-braised oxtail. For dessert there’s guava and cream cheese pastries, and coconut flan. This San Francisco favorite known for sourdough baked goods made from a goldminer’s dough starter also turns out kale salad, grilled cheese sandwiches, and baguette burgers along with its slate of breakfast dishes. Sip San Diego- and Belgian-style craft beers at communal tables in a kid- and dog-friendly environment. 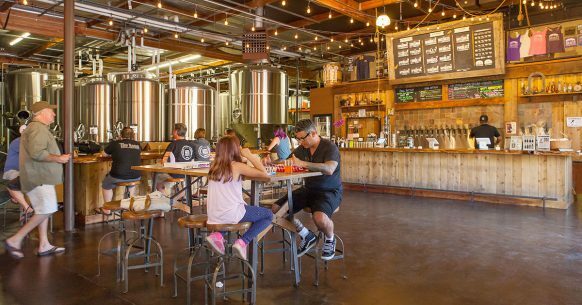 The industrial park surroundings keep this hidden gem and its tasting room quiet and comfortable. And anyway, you’re there for the ample hops and mastery of Belgian styles found in this local brewery favorite’s line. Sushi and sashimi are only the start at this sleek but casual Japanese eatery. The menu also sports plenty of interesting small plates (try the seasoned Kamikaze fries), ramen, fried calamari, broiled fish, and oysters on the half shell. Craft beers and gyoza are $4 each at the daily happy hour from 3 p.m. to 6 p.m. Stay for the mochi ice cream. This casual Lebanese spot serves all your fave Middle Eastern bites like falafel, shawarma, baba ghanouj, cucumber salad, and hummus in sandwich, plate, or a la carte form. Fresh food is served at very reasonable prices (gotta love that $5.99 falafel), plus you’ll even find some rare indulgences like Turkish coffee and knafe. This entry was posted in Culinary and tagged entertainment, north inland by San Diego Magazine. Bookmark the permalink.